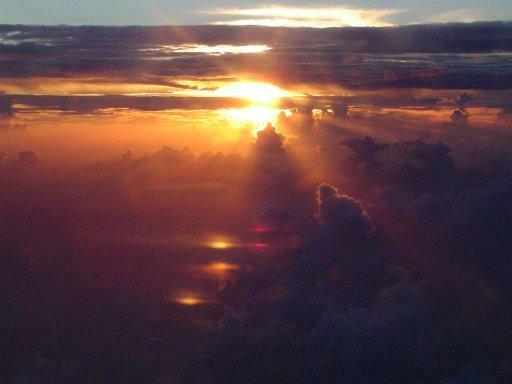 I was flying from LAX to NZ via Tahiti on Friday 5th December 2003 and got a picture of the sunrise about an hour out of Tahiti. It shows some bodies below the sun, they dont seem to be flares cuz theyre behind the clouds. This is a lateral view toward the sunset, with the Fire Dragon in unmistakable red color coming through the clouds! Accompanying illuminated moon swirls, with Surround Personas, below. The complex lies along the Ecliptic, on the Libra/Virgo side.